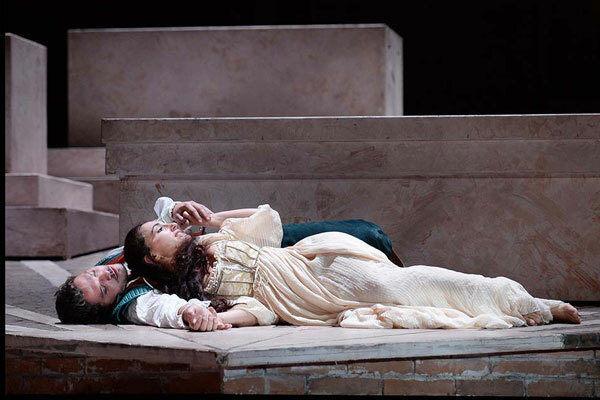 The star crossed lovers from Verona, whose sweet love ends in a double suicide, reach the opera stage in Gounod’s larger than life French masterpiece. 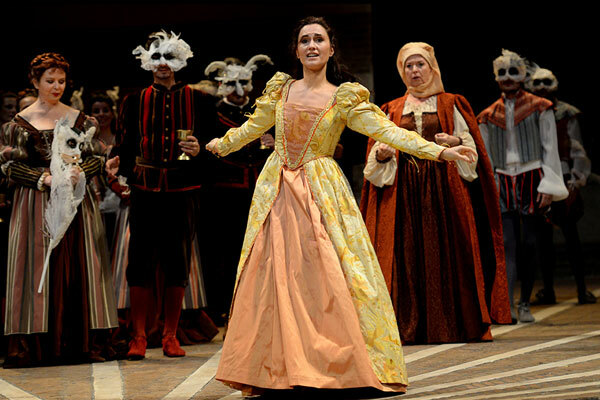 A ball at the Capulets' Palace. 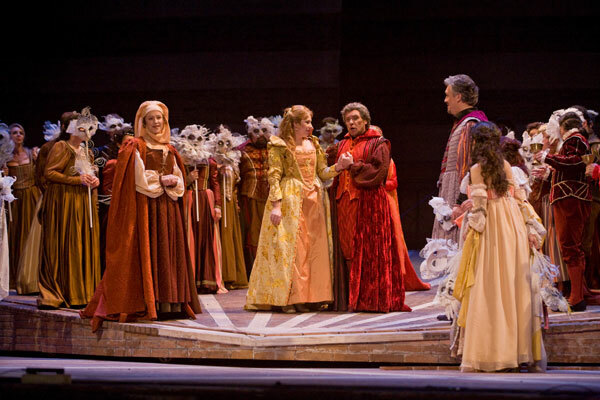 After the prologue-overture which, as in Shakespeare's play, presents an outline of the drama, the curtain rises on a dazzling ball in the palace of the Capulets. They are celebrating Juliet's birthday. Her father, Count Capulet, the master of the palace, has promised her to Count Paris. Everyone admires the young girl's beauty, and her father bids the guests to enjoy themselves. Two masked members of the rival Montague clan, Romeo and Mercutio, have slipped incognito into the ball. Romeo has dark forebodings, but his friend jokes teasingly that Mab the Queen of Dreams must have paid him a visit during the night. Suddenly Romeo sees Juliet at a distance and is immediately smitten with love for her. 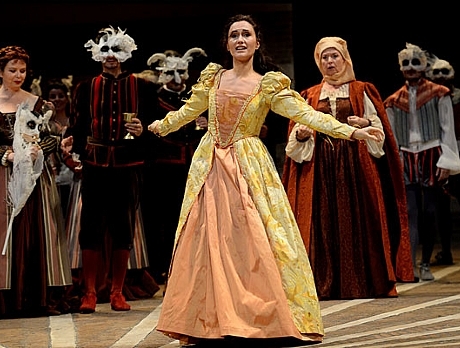 Juliet confesses to her nurse, Gertrude that she would like to enjoy her youth before getting married. Seeing that Gertrude has been called away, Romeo approaches Juliet and declares his love for her, which arouses tender emotions inside her. The arrival of Tybalt, Juliet's cousin, brutally shatters the enchantment. Romeo realizes that his beloved is the daughter of his enemy Capulet, while Tybalt recognizes the voice of the hated Romeo. The lovers are horrified to discover that they belong to two families separated by an ancient and hate-filled feud. 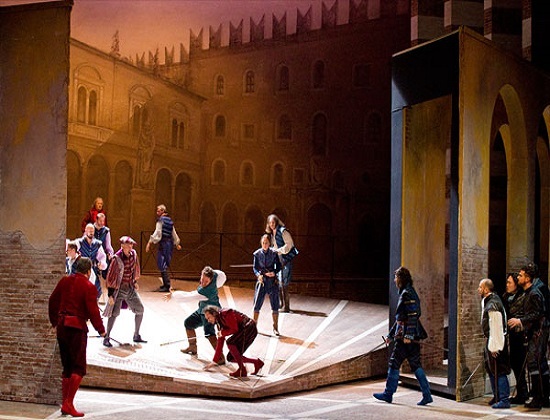 The rules of hospitality forbid Tybalt from venting his anger, and Capulet orders the festivities to proceed. Night has fallen. Romeo is alone and enters Juliet's garden. He sees her at her window and compares her beauty to that of the rising sun. Juliet steps out onto her balcony and the two lovers pledge their love for each other. But their idyll is interrupted by the arrival of a group of servants led by Gregorio searching for some Montagues suspected of slipping into the ball. Gertrude sends them away and then calls Juliet in, scolding her for not being in bed. The lovers reluctantly take leave of each other, promising to meet again the next day. At sunrise Romeo and Juliet go to Friar Lawrence's cell. Deeply moved by the force of their love he agrees to marry them in secret. Gertrude, who has arrived in the meantime, shares their joy. Shortly afterwards Romeo's page, Stephano, comes looking for his master. He mockingly compares the Capulets' palace to a vultures' nest where Juliet, a white dove, is living in bad company. The reaction is swift: Gregorio challenges him to a duel. Mercutio rushes in to help Stephano. Then Tybalt rushes into the affray. 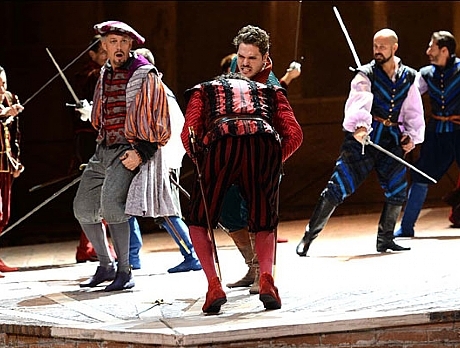 Romeo runs in to calm everyone down and refuses to fight against Tybalt who is now his cousin by marriage. 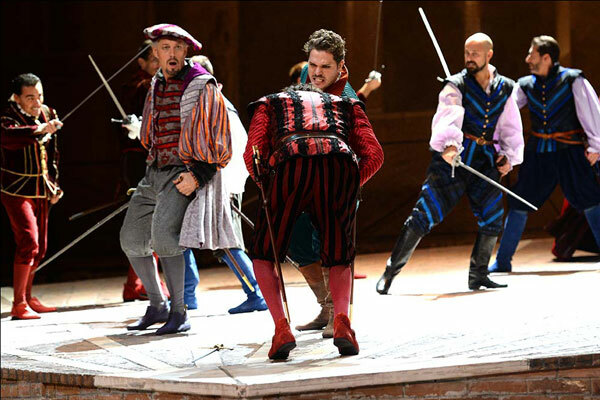 But Mercutio is mortally wounded and Romeo immediately avenges his death by killing Tybalt. 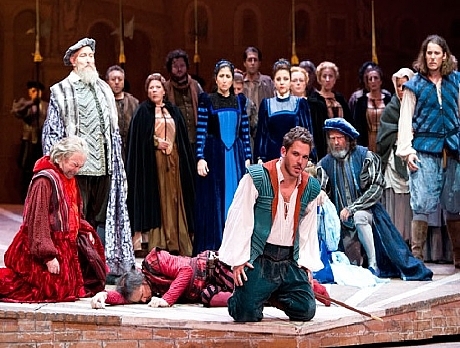 The Duke of Verona observes the disaster and after pronouncing very harsh words against both families he banishes Romeo from Verona. Romeo has joined Juliet for one last night. She forgives him for killing Tybalt. The song of the lark announces the dawn, the moment of their heart-rending farewells before Romeo's departure. 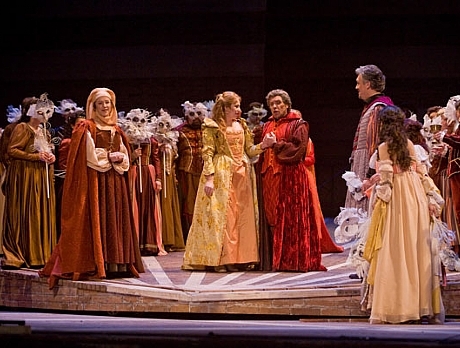 Capulet enters, accompanied by Friar Lawrence who has to prepare Juliet for her imminent marriage to Paris. Alone with Juliet, who wants to die, Friar Lawrence persuades her to drink the potion. The friar leaves and Juliet begins to feel the effects of the poison. The tomb of the Capulets. Believing that Juliet is dead, Romeo takes one final look at her and then drinks the poison. Juliet slowly wakes from her deep sleep. Their joy at being reunited is short lived. Romeo weakens. Juliet sees the empty phial and realizes what has happened. She stabs herself and the lovers die in each other's arms, imploring God's forgiveness.